Joshua McConnell of Laramie is one of two UW McNair Scholars to present their research at the SACNAS regional meeting. Two University of Wyoming McNair Scholars were selected to present their research to a regional minority organization in Denver, Colo.
Joshua McConnell of Laramie and Raymond Soto of Powell presented their research at the Society of Chicanos/Chicanas and Native Americans in Science (SACNAS) regional meeting. SACNAS assists minority students to complete their education. 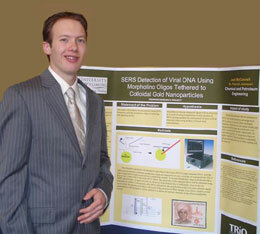 McConnell, a junior in chemical engineering, gave a poster presentation titled "SERS Detection of Viral DNA." McConnell's work was directed by faculty mentor Patrick Johnson of the UW Department of Chemical and Petroleum Engineering. Soto, a junior in Microbiology, presented a 75-minute workshop for a track titled "Conversations with Scientists." He incorporated research he did last summer with faculty mentor John Willford from the departments of Microbiology and Molecular Biology. The title of his workshop was "The Laboratory Research Experience: Planning, Preparation, and Process." The McNair Scholars Program, funded through the United States Department of Education, helps prepare promising undergraduate students to pursue doctoral degrees. It targets first-generation college and limited income students as well as ethnic minority students.